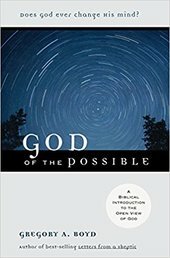 A friend handed me a copy of God of the Possible: A Biblical Introduction to the Open View of God recently. This book is a popularly read manifesto, written in defense of the doctrine known as open theism. Much of the basis and rationale for God of the Possible is present in the introduction, and for that reason I have addressed this section below. Boyd here presents a false dichotomy between God’s sincerity in warning Hezikiah of imminent death and God’s mercy in answering Hezikiah’s prayer for fifteen more years. The biblically consistent position would be, the means by which God intended to extend Hezikiah’s life was his warning and Hezikiah’s resultant prayer. God’s purpose in such a scenario is obvious; God wanted to demonstrate to Hezikiah, just as with Israel, his survival was due to God’s mercy alone. Hezikiah would be delivered from the disease, and Israel would be delivered from Assyria. God intended for Hezekiah to react to his announcement with desperation as in 2 Kings 20:3. Subsequent to Hezikiah’s cry for help, the Lord announced that he would heal him (vv. 5-6) and the Lord proved this healing by making time reverse (vv. 10-11). It is a curious notion that on Boyd’s view, God can turn back time itself, but he cannot foresee future events. Such a construct is completely inconsistent. Here, Boyd attempts to procure reasons to jettison divine sovereignty and omniscience by pointing to atrocities and the damnation of the reprobate. These objections however, are not biblically viable since 1) God explicitly says he intends for atrocities (e.g., Joshua 6:20-21; Gen 50:20; Acts 2:23), and 2) It is not unjust for God for God to end a sinners life or send them to hell (Rom 6:23; Matt 25:41-46). Rather, justice cries aloud for the damnation of the rebel. What if God, desiring to show his wrath and to make known his power, has endured with much patience vessels of wrath prepared for destruction, in order to make known the riches of his glory for vessels of mercy, which he has prepared beforehand for glory— even us whom he has called, not from the Jews only but also from the Gentiles? Additionally, the notion that God is omni-benevolent (i.e., “all-loving”) needs to be tempered with the God’s own description of who he is and how he feels. There are numerous passages wherein God identifies that he hates certain people (e.g., Psalm 5:5; Psalm 11:5; Hosea 9:15). Thus, any notion of God being omni-benevolent must be directed toward his own people, and not toward creatures in general. The difficulty here is that Boyd has wrongly assumed who Peter is referring to when he says, “but is patient toward you.” The question is, who is the plural “you” in Peter’s statement? If one gives even a cursory look to the context of Peter’s statement, when Peter says “you,” he is referring to the church he is addressing (cf. v. 1). Therefore, what Peter is saying is that the reason why Jesus hasn’t returned yet is because God is patient toward you (i.e., the church), not wishing that any (church attenders) should perish, but that all (church attenders) should reach repentance. This sentiment that is similar to statements given by Jesus (Rev 2:5; 2:16; 3:3), and Paul (2 Cor 7:9-10; 12:21; 2 Tim 2:25). Subsequently, Boyd’s question is based upon a misreading of the Bible. Why does God invite those he knows will never believe to receive his grace? Whatever answer is given to this question, we must first affirm that whatever the Bible says ought to determine our doctrine, and not our questions or our level of satisfaction with the Bible’s answer to our questions. While I agree with the classical Reformed answer to this question, I will here only point to the Scripture. God explicitly states that he, by his sovereign grace, determined to save a particular people by extraordinary means. So too, God also states that the gospel ought to be offered to every creature. If we are to hold high the Bible, we must say, regardless of how we parse out these two propositions, that they are both true and not contradictory. Bruce Ware, God's Lesser Glory: The Diminished God of Open Theism, (Wheaton: Crossway, 2000). _____. God's Greater Glory: The Exalted God Of Scripture And The Christian Faith, (Wheaton: Crossway: 2004). John Piper, Justin Taylor, Paul Kjoss Helseth Eds., Beyond the Bounds: Open Theism and the Undermining of Biblical Christianity, (Wheaton: Crossway, 2003). John Frame, No Other God: A Response to Open Theism, (Phillpsburg: P & R, 2001). All Bible quotations taken from the English Standard Version, (Wheaton: Crossway, 2001). It ought to be noted here that Boyd does not have a biblical doctrine of hell. Rather, he affirms the aberration known as annihilationism. For a rigorous biblical refutation of that viewpoint, see Robert Peterson, Hell on Trial: The Case for Eternal Punishment, (Philipsburg: P & R, 1995). See R. Scott Clark Ed., & Introduction, John Murray, The Free Offer of the Gospel, http://rscottclark.org/2012/09/the-free-offer-of-the-gospel/.